Ta Fong Flour Mill CO., LTD.
(Pierre, SD) ---The wheat industry will welcome some of the most loyal customers of American wheat when the Taiwan Goodwill Mission arrives in South Dakota on September 29 to sign a Joint Communiqué regarding their intent to purchase wheat. "The industry looks forward to these biannual visits," says Steve Halverson, chairman of the South Dakota Wheat Commission. Representatives of the Taiwan Flour Mills Association (TFMA) have historically signed letters of intent on U.S. wheat purchases for several years. 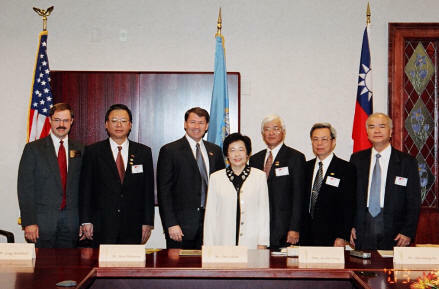 Before coming to South Dakota the Taiwan millers' group will perform a signing ceremony in the nation's capital and visit with industry officials. While in South Dakota they will review the quality of this year's wheat crop and meet with representatives of the South Dakota Wheat Commission and other wheat producers, as well as government officials. Taiwan's flour mills have given U.S. wheat over 90 percent of its market share in each of the last seven years and in nearly every single one of the previous 43 years. "It is the longest unbroken record of customer loyalty," says Halverson. "A cash paying market that the U.S. wheat industry can be extremely grateful for". Beyond Taiwan's recognition of the intrinsic value of U.S. wheat, the strong ties between Taiwan and U.S. wheat producers go back to the years when America provided food aid to a hungry country. An official from one of Taiwan's largest mills, on a trade mission to the U.S. two years ago, explained why there was a special bond, beyond good business relations, between our industries. "I remember years ago, when Taiwan was still very poor, being very grateful when our family received flour donated from the United States," he said. "When Canadians and Australians ask why Taiwan doesn't buy more of their wheat I ask them: 'What have you invested in our country?'" Participants in the Goodwill Mission include: C.H. Ho, Chairman, Ta Fong Flour Mill, Taichung; Rocky W. Chen, President, Universal Flour Mill, Kaohsiung; C.H. Huang, Secretary General, TFMA. The team will be guided by USW's K.H. Lu. U.S. Wheat Associates develops export markets on behalf of American wheat farmers. Working in more than 100 countries, USW offers information, education and assistance to buyers, millers, bakers, traders, and government officials in all export markets. The South Dakota Wheat Commission is one of 17 states that use check off dollars to operate USW. The signing ceremony will be held 9:30 a.m., Tuesday, September 30 in Governor's Large Conference Room at the Capitol building. Governor Rounds is tentatively scheduled to witness the signing of the Joint Communiqué which will be signed by Halverson on behalf of the South Dakota wheat industry.